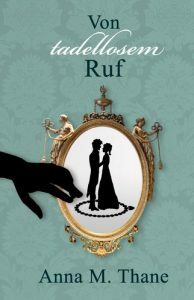 Republican cleric Dr. Richard Price spying on Marie Antoinette at Versailles as she is assailed by ruffians. 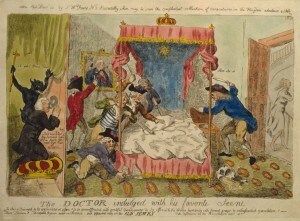 Isaac Cruikshank, c.1790. Courtesy Library of Congress. 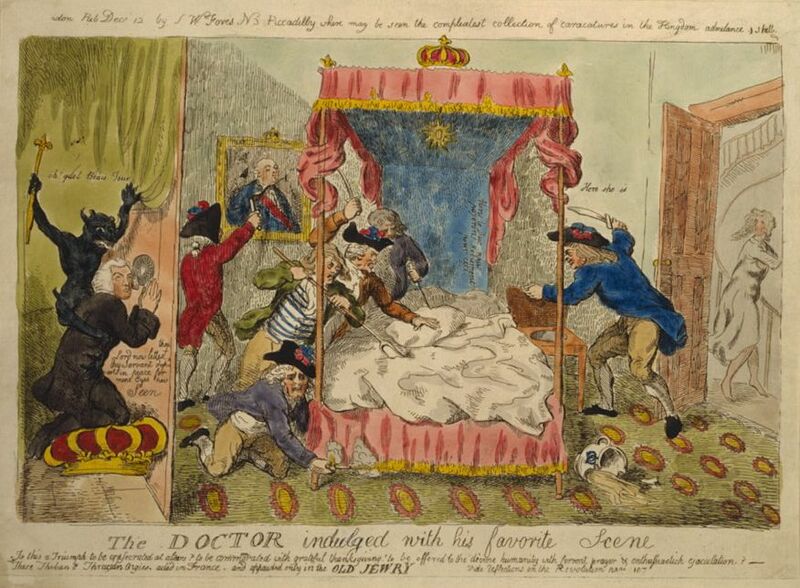 The Regency era was one of great paranoia and suspicion. Britain was at war with France, and Ireland was a hotbed of rebellion. So this was a busy time for the government’s spies on the domestic front as well as abroad. Rebels knew that their mail was likely to be intercepted, so they went to great lengths to circumvent the authorities. Assuming an alias was an obvious trick. Messages between groups were conveyed face-to-face, or letters were sent by trusted couriers. In the late 1790s, it was reported that at least one dissident Irishman took secret messages from England to Ireland using a secret compartment in one of his shoes. The letter was placed in the cavity, and covered in strong paper to protect it. Then the sole of the shoe was sewn back on again. Yet another method was invisible ink. In 1817 a suspected underground revolutionary movement in England’s manufacturing districts was infiltrated by William Oliver, alias W. J. Richards, alias Hollis. He reported that ‘No Letters were to be sent to anyone by Post’, but instead ‘in parcels by a Coach for fear of being detected…Much secret Writing appeared to have been used by them to each other, tho’ a Letter would appear begun and finished in Ink.’ The secret message was revealed ‘by browning [warming] the Letter before the Fire. This method was tried, in my Presence, using small beer [as ink], which seemed to answer the purpose’. The letters were burnt after being read. Secret codes were used by the Home Office and some revolutionaries. The government’s special agents were referred to in government correspondence by letter codes, e.g. ‘B’ or ‘X Y’. Often, anonymous spy reports were forwarded to the Home Office by the local authorities from a ‘confidential person’. 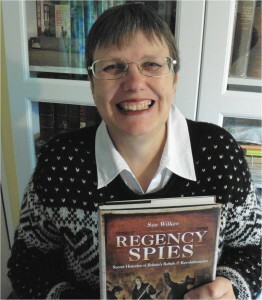 Sue Wilkes is the author of Regency Spies (Pen & Sword, 2015) and A Visitor’s Guide to Jane Austen’s England (Pen & Sword, 2014). She is currently writing Tracing Your Manchester and Salford Ancestors for Pen & Sword.